Both Durham City and the wider area of County Durham, with castles, cathedral, stately homes and industrial heritage has a number of hauntings. 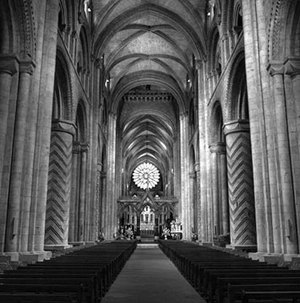 In Durham Cathedral it is said that a secret passage runs from the cathedral to Finchale Abbey, though the journey is so terrifying no person can survive it. In Durham Prison a ground floor cell is haunted by the scene of one prisoner murdering another with a knife. In Durham Castle the wife of one of the former Prince Bishops of Durham haunts the black staircase where she fell down and broke her neck. In Lumley Castle ghostly monks are sometimes seen walking in file around the area of the castle, while Lady Lumley walks within the castle's corridors and grounds. An Australian cricket player reported seeing the monks in 2005. For ghost tours in Durham contact us. This 3 story building below Elvet Bridge is a former house of correction with what were dungeons & a mortuary created in 1632. Horrific conditions of the prison cells were regarded as the country’s worst & many inmates never left alive. The most famous was a piper named Jimmy Allen. It’s believed his eerie pipe music can still be heard here some nights. People have also heard a whispery female voice & seen shadowy figures. Some have felt as though they’ve been scratched, pushed or even punched by unseen hands. Created in 1878 to help educate the local miner’s children. It’s been the setting of happy memories, tragic loss and untimely death. Today there is believed to be a mischievous entity in this building with objects being found out of place for no apparent reason. In every room people often hear what sounds like children running around and playing. Strange figures are seen moving from one room to another with sounds of talking, shouting and slamming doors. A former school which dates back to 1875 has been host to some horrifying experiences since reopening as a community centre. Some have experienced a sense of dread with an awful feeling of being watched. People have been pushed or even scratched by something that they cannot see. Sounds of footsteps have been heard walking up and down and the apparition of a lady dressed in white has been seen in different parts of the building.